We look forward to "The Boys' Night Out." Ah, pillow fights, popcorn, and marathon movies on TV, you ask? No. "Boys' Night Out" is when the longhorned male bees in our pollinator garden in Vacaville engage in sleepovers on our Mexican sunflowers (Tithonia) and other blossoms. At night, the girls sleep inside their nests, and the boys cluster on flowers. 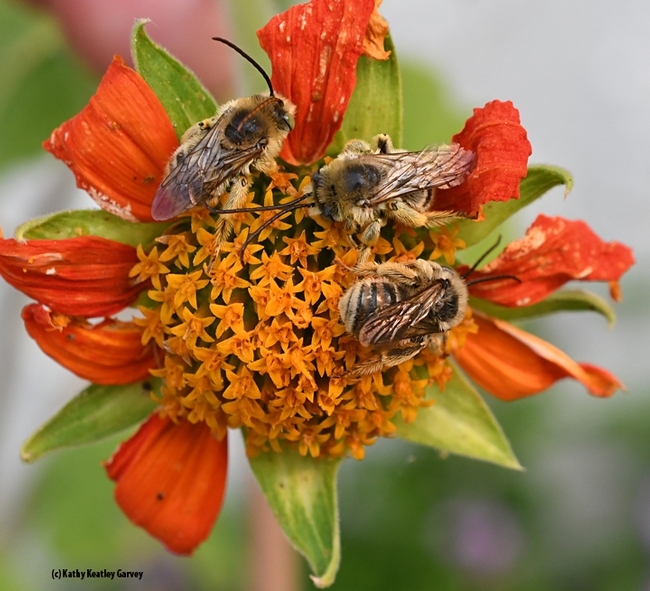 Lately, we've been admiring a trio of boys--Melissodes (possibly M. robustior, as identified by Robbin Thorp, distinguished emeritus professor of entomology at the University of California, Davis)--bunking down on a Tithonia. Every day, around sunset, they head over to the same flower, arrange themselves in comfortable sleeping positions (hey, quit kicking me), and it's nighty-night! When the sun rises, they vacate the bedroom. 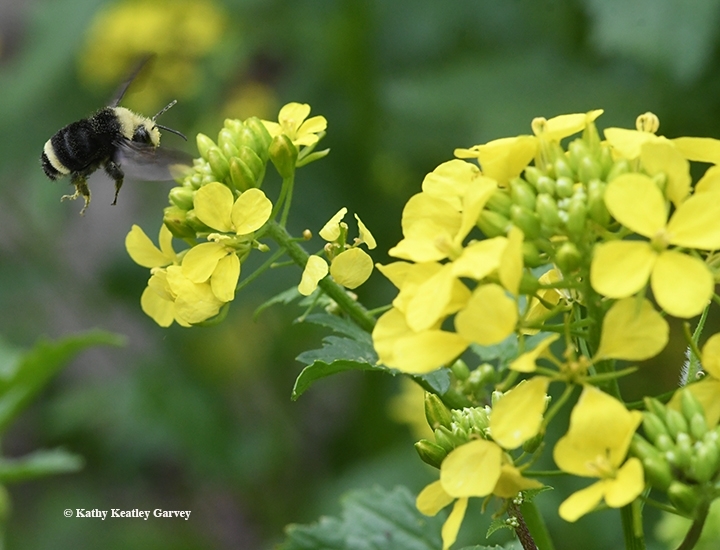 Sometimes it's earlier than planned, no thanks to buzzing bumble bees, carpenter bees and honey bees foraging around them and disturbing their beauty sleep. The nerve! Other species of male longhorned bees--including Melissodes agilis and Svastra obliqua--sleep on flowers at night as well. "Most frequently, the boy bee overnight clusters are single-species clusters," says Thorp, co-author of California Bees and Blooms, a Guide for Gardeners and Naturalists, with UC-affiliated authors Gordon Frankie, Rollin E. Coville, and Barbara Ertter. 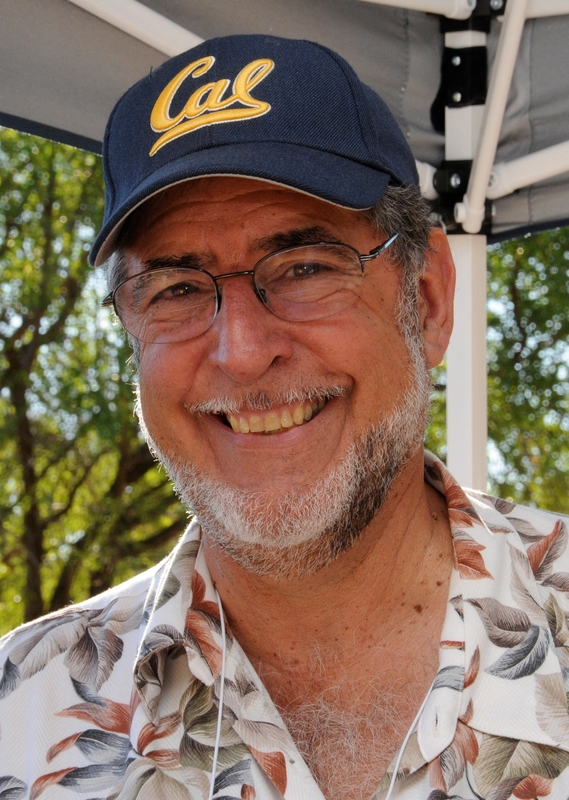 Thorp, who holds a doctorate in entomology from UC Berkeley and taught entomology at UC Davis from 1964 to 1994, continues to "bee involved" in research, writings, bee identification and public outreach. He teaches annually at The Bee Course (American Museum of Natural History), at the Southwestern Research Station, Portal, Ariz. The nine-day intensive course is offered for conservation biologists, pollination ecologists and other biologists who want to gain greater knowledge of the systematics and biology of bees. In a previous Bug Squad blog, Thorp responded to a reader's inquiry about "stings" from the clustering bees. "Boy bees cannot sting," he pointed out. "They lack a stinger which is a modified ovipositor in their wasp ancestors. Occasionally a girl bee may spend the night out if she is caught by sudden drop in temperature. Usually she will not be part of a group sleep over. So don't attempt to handle unless you are confident you can tell boy bees from girl bees or they are too sleepy to defend themselves." The reader also asked: "Typically how close to the girls' nest(s) do the boys' slumber? I want to try and make sure I don't touch it when planting at end of summer." "Boy sleeping aggregations are based on a suitable perch and not related to where females are nesting, but probably no more than 100 yards from the nearest female nest," Thorp answered. "Females nest in the ground and have rather distinctive round holes about the diameter of a pencil or slightly smaller, sometimes with small piles of dirt around them looking like mini-volcanos. The holes may be widely separated or clustered together depending on the species, but each female digs her own burrow." The reader also wondered: "When watching the boys tonight, about ten of them started waking up and kicking each other. They finally settled down and started to nestle back in for the 'night'--it was only 6 p.m.--but I wasn't sure if my presence was getting them riled or they tend to act like kids sharing a bed?" Said Thorp: "The boys usually settle in as the light dims in the evening. Cool, and drizzly conditions may modify bed time. Each establishes his own spot, so there may be some jostling for position initially." 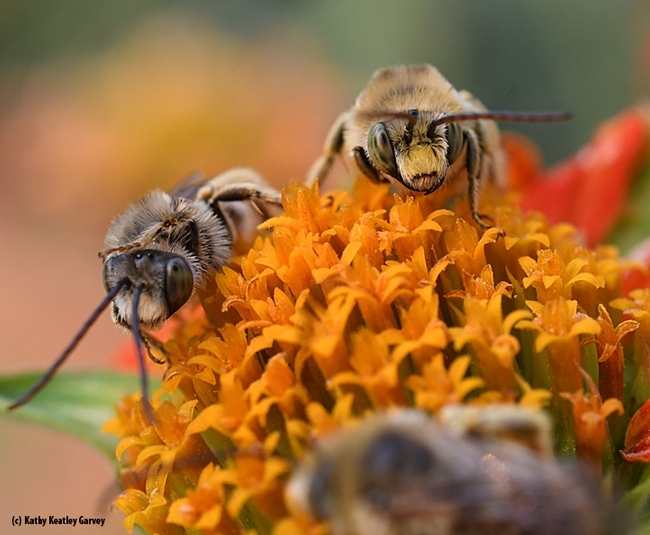 Longhorned bees are among the more than 1600 species of undomesticated bees that reside in California. In their book, California Bees and Blooms, the authors focus on 22 of the most common genera and the flowers they frequent. Meanwhile, check out Frankie's UC Berkeley Urban Bee Lab website to read more about native bees and the exciting research underway. 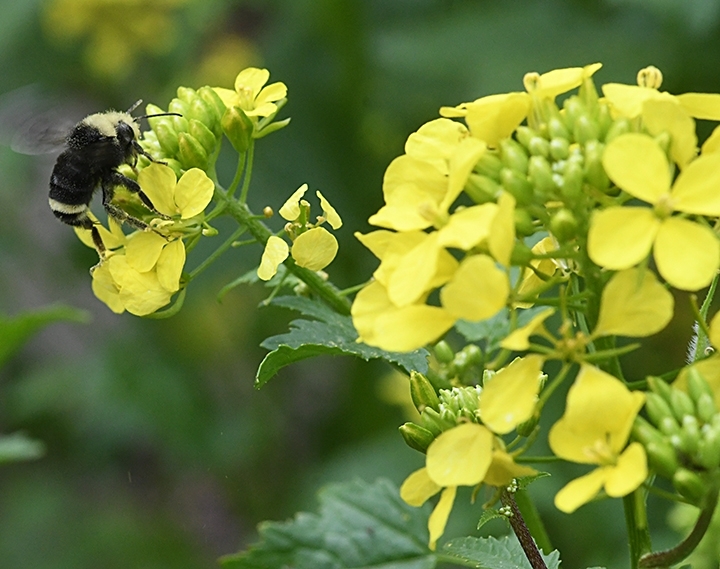 What's better than a yellow-faced bumble bee (Bombus vosnesenskii) on yellow mustard? Not much. Both are signs of early spring. Mustard is popping up all over, along with oxalyis and wild radish. The earth is warming. Spring is here. Get ready. In the University of California book, California Bees and Blooms: Guide for Gardeners and Naturalists, the authors write that B. vosnesenskii and B. melanopygus "are considered spring bees because that is when their population is highest, tailing off in numbers the rest of the year." The book is the work of Gordon Frankie, UC Berkeley entomology professor; Robbin Thorp, distinguished emeritus professor of entomology at UC Davis; photographer and entomologist Rollin Coville (he received his doctorate from UC Berkeley), and botanist Barbara Ertter, also affiliated with UC Berkeley. Be sure to check out their companion pocket guide on the UC ANR website. It's titled Common Bees in California Gardens. It will help you identify 24 of the most common bees found in urban gardens and landscapes. That's 24 out of nearly 1600 species of native bees found in the Golden State. It's spring and it's loud in the Spanish lavender patch. The girls--the honey bees--are buzzing furiously as they forage among the blossoms, but so are the boys, in this case the mountain carpenter bee, Xyclocopa tabaniformis orpifex. The girls are there for the pollen and nectar to take back to their colonies, and the boys are there for some flight fuel. And to find mates. Xyclocopa tabaniformis orpifex is one of three species of California carpenter bees: the others are Xyclocopa varipuncta (the largest one, about the size of a bumble bee), and Xyclocopa californica. All females are mostly black. 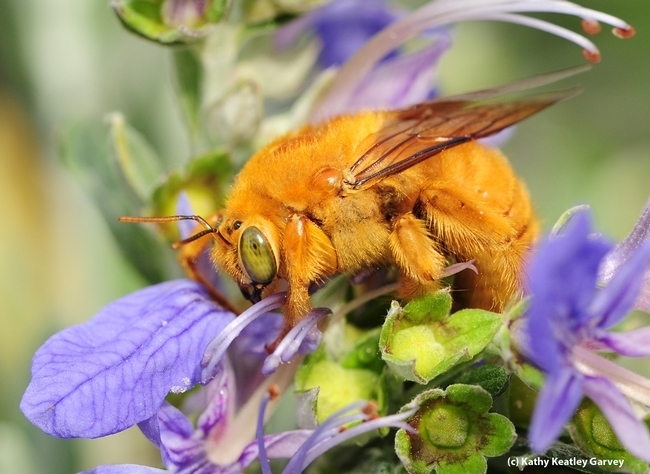 The male Xyclocopa varipuncta, aka "the teddy bear bee," is a golden with green eyes. The other males often have yellow hair on their head or thorax. The carpenter bees usually fly from March through October, according to California Bees and Blooms, A Guide for Gardeners and Naturalists, a University of California production featuring the work of Gordon Frankie Robbin Thorp, Rollin Coville, and Barbara Ertter (Thorp is a distinguished emeritus professor of entomology at UC Davis, Frankie is a professor at UC Berkeley, and Coville and Ertter are also affiliated with UC Berkeley). A handy identification pocket guide--a companion to California Bees and Blooms--is Common Bees in California Gardens, published by the University of California Agriculture and Nature Resources. It will help you identify 24 bees and you can lean about the distribution, flight season, nesting habits, floral hosts and how each bee species transports pollen. 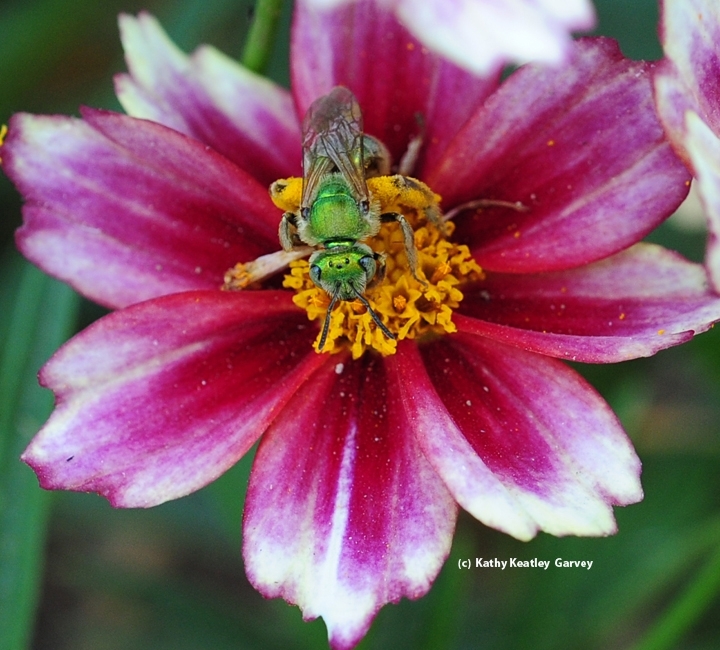 You'll see beautiful images by noted photographer Coville, who holds a Ph.D. in entomology from UC Berkeley. Excellent publications! The more you know about bees, the more likely you are to protect them and plant for them. You never know what you'll find when you visit a pollinator garden. 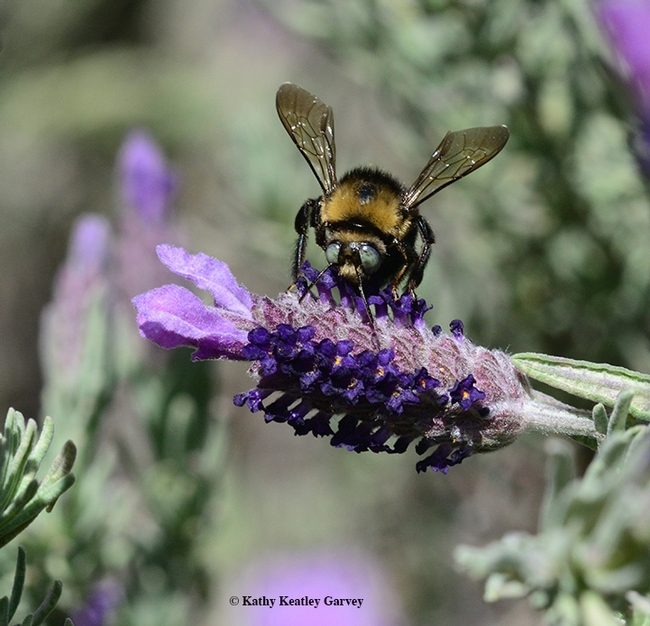 Take the case of our visit Nov. 12 to the Sonoma Cornerstone, Sonoma, to see the pollinator garden of Kate Frey, an ardent pollinator advocate, world-class garden designer, and co-author of The Bee Friendly Garden with UC San Francisco professor Gretchen LeBuhn. The flower-filled Frey garden is a people/pollinator favorite at the Sonoma Cornerstone, and no wonder. 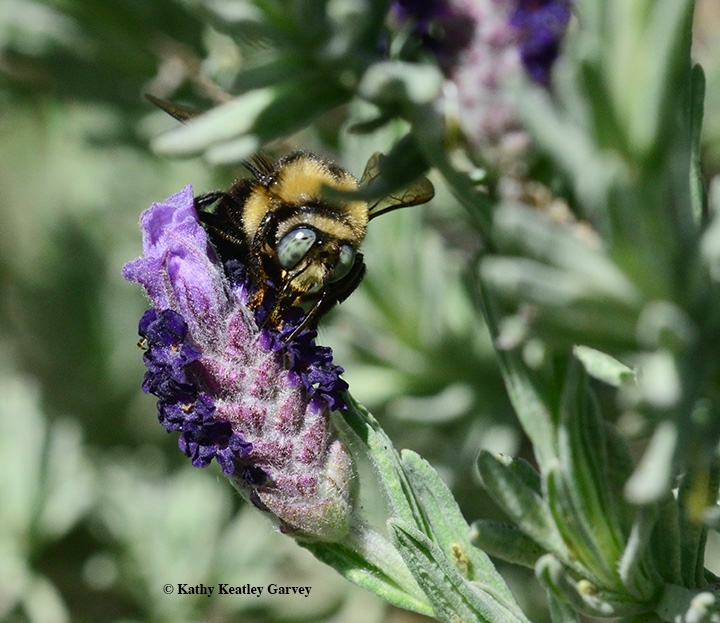 We spotted a yellow-faced queen bumble bee, Bombus vosnesenskii, foraging on Salvia Indigo spires. Normally, you don't see bumble bees this time of year, but this one came out of hibernation temporarily to eat. She appeared famished! 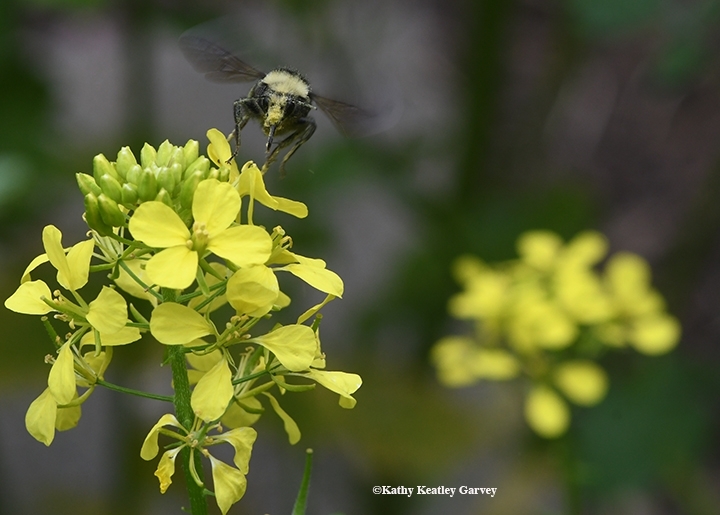 Bombus vosnesenskii is among the bees featured in the University of California-authored book, California Bees and Blooms: A Guide for Gardeners and Naturalists (Heyday Press). It's the work of entomologists Gordon Frankie of UC Berkeley and Robbin Thorp of UC Davis, entomologist/photographer Rollin Coville and plant expert Barbara Ertter of UC Berkeley. 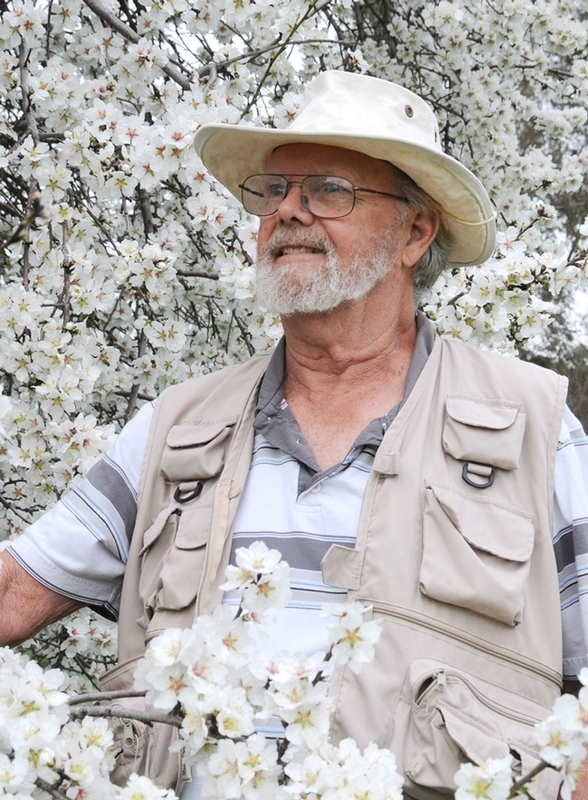 Thorp, a UC Davis distinguished emeritus professor, also co-authored Bumble Bees of North America: An Identification Guide (Princeton University). In their book, California Bees and Blooms, the authors call attention to this iconic Bombus species: the yellow hairs on the face and top of head, and the yellow stripe on the abdomen. Hibernating queen bumble bees are a joy to photograph as they forage for food, buzzing from blossom to blossom to sip nectar. This one seemed to be braking during a winter break. Have you ever seen a bee buzzing around your garden and wondered: "What's that bee?" Or have you ever seen a bee nectaring in a community garden and wondered "How can I attract THAT bee to my yard?" Just like all floral visitors are not bees, not all bees are honey bees. However, the honey bee, Apis mellifera, is the most well known. Worldwide, there are 20,000 species of bees. Of that number, 4000 are found in the United States, and 1600 of them in California. Here's how you can find out more about them. 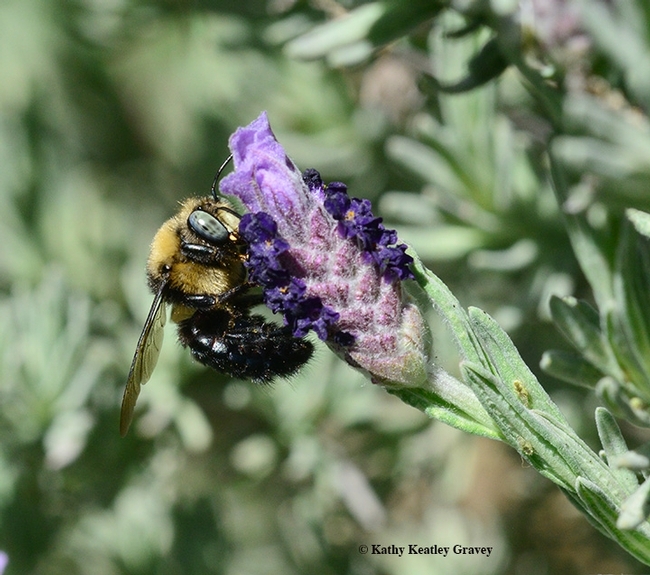 The University of California Hopland Research and Extension Center has scheduled a four-hour program, from 10 a.m. to 2 p.m. on Saturday, Sept. 23 on "Native Bees in Your Backyard" at two sites in Hopland and you're invited. 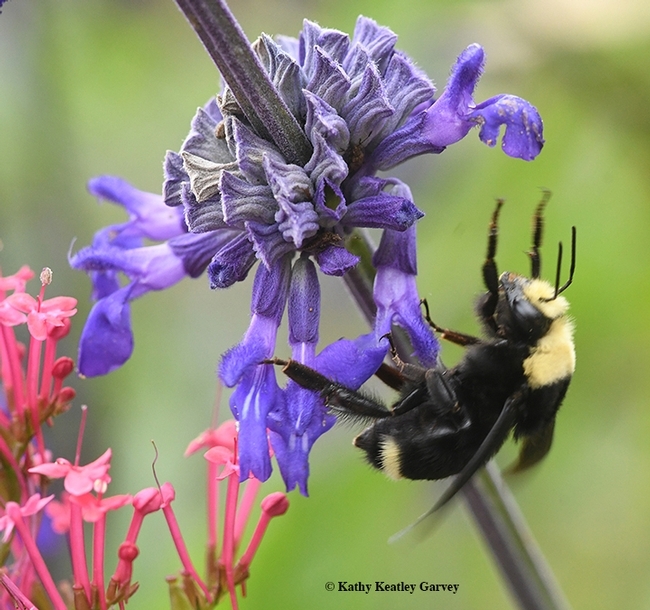 UC Berkeley professor Gordon Frankie and entomologist/photographer Rollin Coville, co-authors of California Bees and Blooms: A Guide for Gardeners and Naturalists, will discuss native bees. 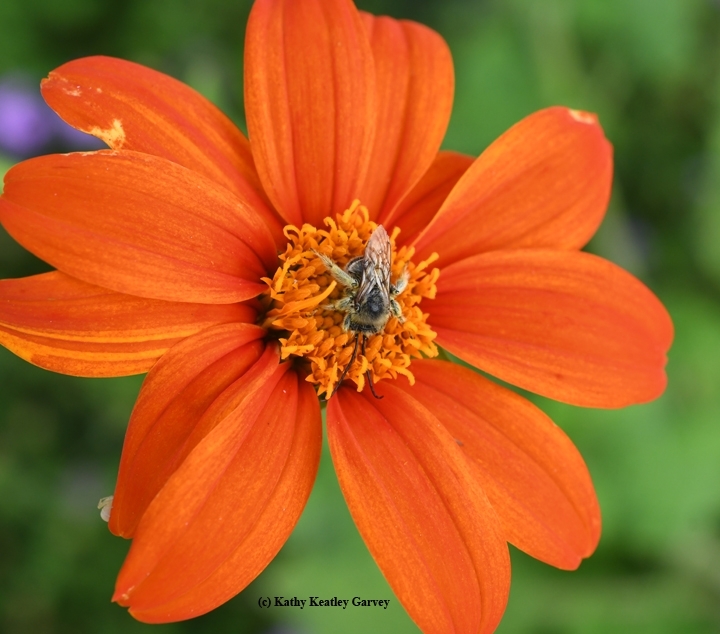 They and will be joined by Kate Frey, award-winning gardener and author of “The Bee-Friendly Garden" who will provide a guided tour of her gardens and explain what plants attract pollinators. Her gardens are renowned for their floristic diversity, color and the habitats they provide for wildlife. 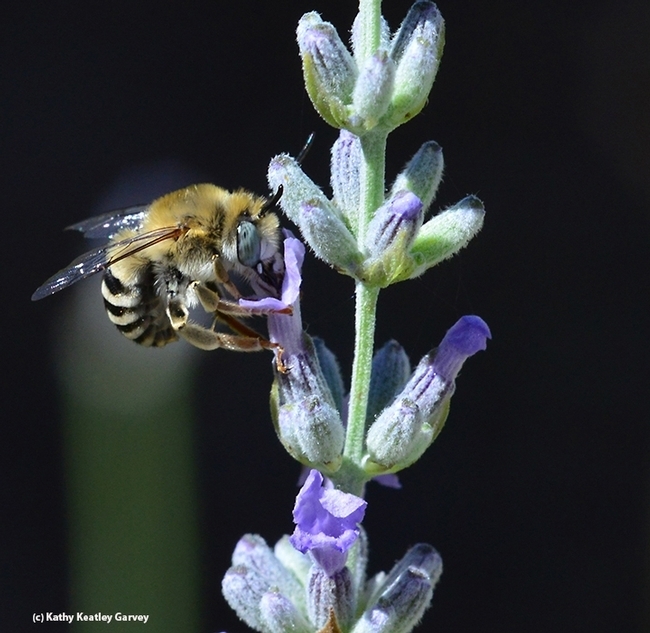 Participants will meet from 10 a.m. to 11:30 a.m. at the Kate Frey Gardens and from 11:30 to 2 p.m. at the UC Hopland and Research Center, 4070 University Road, Hopland, from 11:30 to 2 p.m. A locally sourced, honey-themed lunch, catered by Beth Keiffer, will be served at noon. Hannah Bird, community educator at the Hopland Research and Extension Center, says attendees will "learn about some of the 1600 native bee species found in California--from the leafcutting bee to the cuckoo bee, the sweat bee to the mining bee!" They will learn how to identify them and how to accommodate their needs. 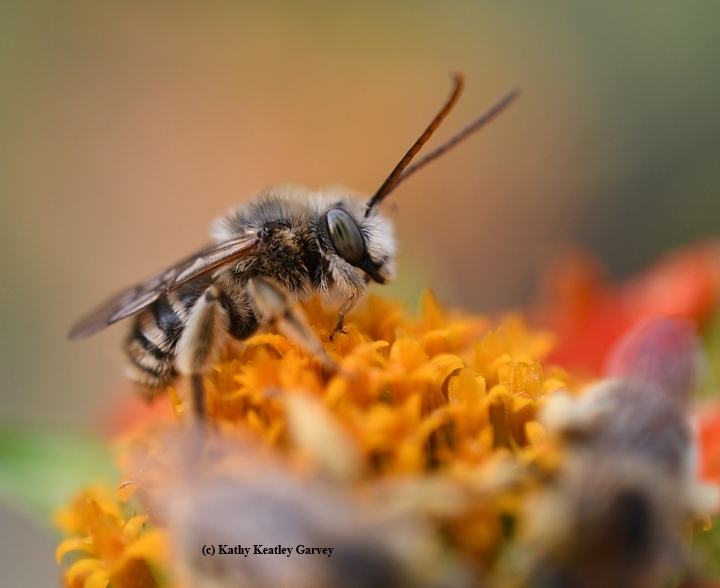 Frankie will share the research done by UC Berkeley Urban Bee Lab and Rollin Coville will display and discuss his photographs of native bees and how he captured the images. Advance registration is required by Sept. 18. The cost is $40, which includes lunch. Click here to register. Maps and directions will be provided to registrants.